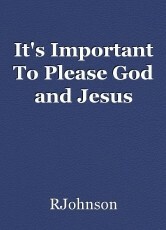 It's important for people to please God and Jesus. We should please them because they please us. We can please them by being honest and not cheating, stealing, killing or lying. We may fail when we attempt to do these things but that shouldn't stop us from trying. The world is going to Hell in a hand basket, it's like a disease. But if we try to do our best, God and Jesus will be pleased. This page was created in 0.4068 seconds.